Pyramids 2, released in October of 2014, has been developed and published by Enjoy Gaming Ltd, a real powerhouse when it comes to puzzle and strategy gaming. 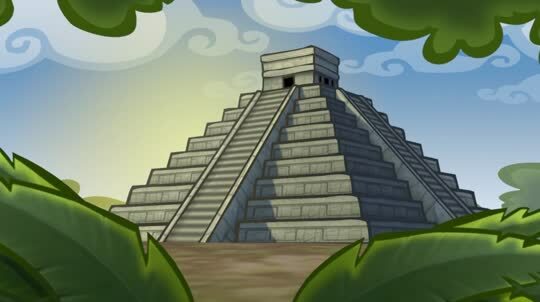 Pyramids 2 features 54 all new levels and 3 new pyramid worlds. There is new improved and varied game play, new features and a built in editor so that players can create their own levels to play, or even better, share with other players on the marketplace. Or so the manufacturers claim anyway. Just as it was in the first game, the target of the game is to guide the explorer through the levels to a key which then opens a door for the explorer to escape out of. Once again, the explorer’s moves are pretty basic with jumping and shooting still possible and also the ability to create or destroy blocks that are directly adjacent to him, either below or in front. The game begins slowly with very few traps and things to catch new players out, giving them chance to adjust to the game speed and physics. This slow pace doesn’t last for long though, with new traps and dangers introduced very quickly to challenge players. Players shouldn’t be too concerned though as they are gifted with unlimited re-tries. Most of the game play and puzzles are similar to the original Pyramids game but there are some additions to spice things up, most noticeably the ability to push blocks around to activate switches and other such things. The graphics are very much in keeping with the original games look, simple but effective and clear and the soundtrack is pretty simple as well. The best feature of Pyramids 2 though is arguably the level creator, as was touched in briefly earlier. In this mode, players can build and create up to 27 unique levels that they can then share with their friends via QR code, modern technology aye. Players have access to seemingly all of the same tools the developers used to build the real levels, meaning some really good and creative puzzles can be built. Overall, Pyramids 2 is an excellent puzzle adventure game with some really good features. There is a massive selection of different features and even some new additions since the last game which coupled with the level builder, make for a game that just keeps on giving. Whilst some puzzle adventure games can get a bit tiring and drag on, Pyramids 2 actually manages to feel fresh and exciting every time you power up the Nintendo and give it a whirl. Slowly but surely players work their way through the 54 levels, collecting items and objects along the way and perhaps most importantly, competing against their friends both in the pre made levels and in ones they dream up themselves. Pyramids is a great game for gamers of any age and ability. Players can pick the game up and put it down without having to get too involved in it or they can spend hour after hour playing to really hone their skills.